Can you believe it’s already August? As per usual, summer just seems to be flying by and the end of the year will be here before we know it. It’s been quite hot and humid here in good ol’ SoCal, and I’ve found one of the best ways to cool off is with a frozen treat like these red white and blueberry popsicles I created a few weeks ago. Since I am a member of Peanut Butter and Co.’s Yum Squad, there is never a shortage of delicious peanut butter in our house. 90% of the time the PB is used in some sort of baked treat or eaten straight out of the jar (I’m looking at you, Dark Chocolate Dreams), but this time I wanted to do something different, so popsicles it was. 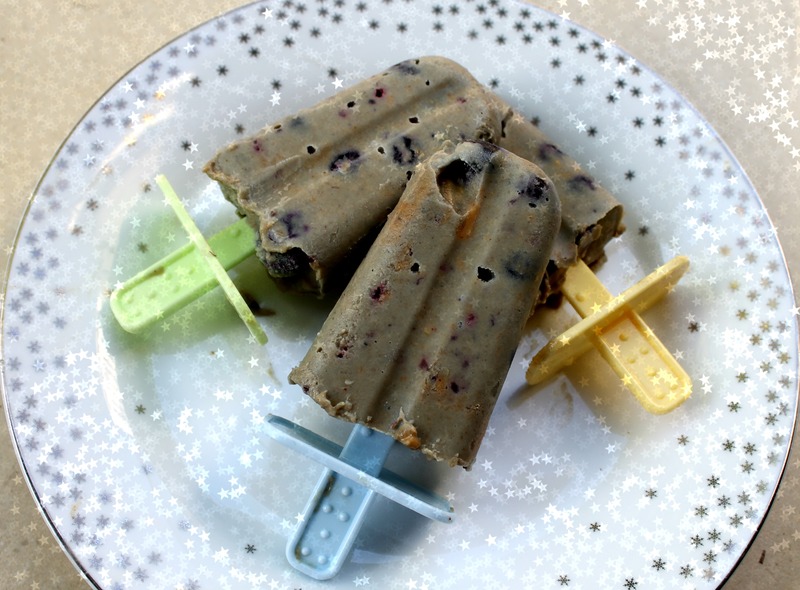 I decided to use Peanut Butter and Co.’s White Chocolate Wonderful as my base, and added in frozen berries, strawberry jam, and a little almond milk to create my red white and blueberry popsicles. I wasn’t completely sure that peanut butter would work as a base, but these turned out SO GOOD. It was basically like eating a delicious frozen pb&j on a stick. 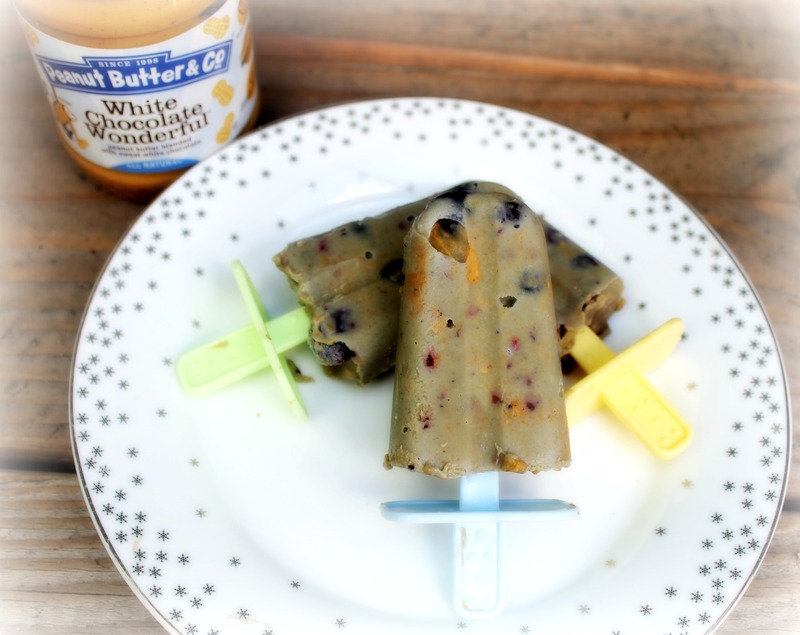 If white chocolate isn’t your thing, these popsicles would be great with just regular PB since the blueberries and jam already add so much flavor. I think next time I’ll have to give these a try with frozen raspberries as well! Mix all of your ingredients into a large bowl. Pour mixture into popsicle molds. Freeze for 3-4 hours or until popsicles are firm, then serve and enjoy! What’s your favorite frozen summer treat? This entry was posted in Dessert, Gluten-Free, Good Eats and tagged peanut butter, summer, yum squad on August 4, 2015 by allie@sweetpotatobites. 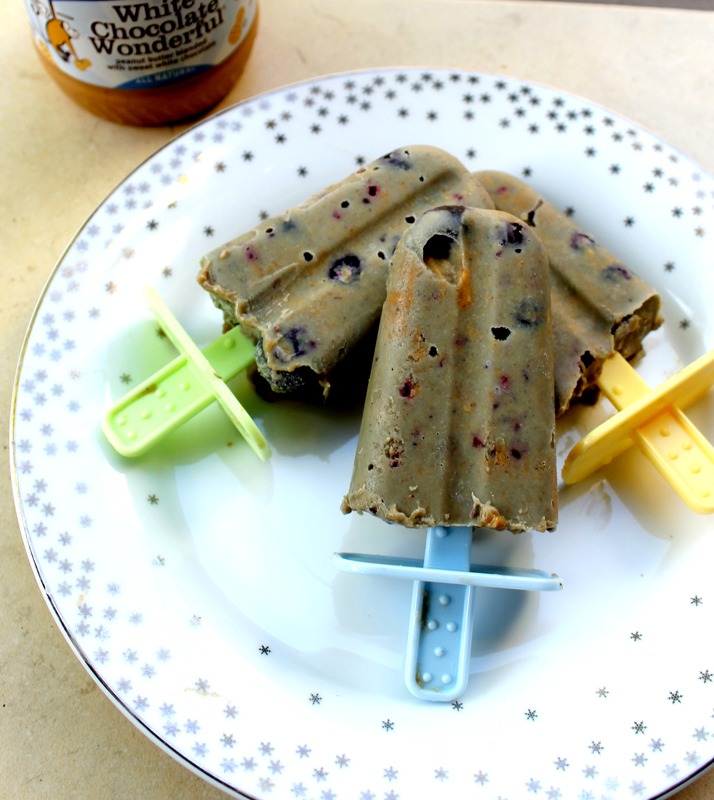 Wow i’d never have thought of using peanut butter in an ice lolly recipe! Great idea! Mmmm PEANUT BUTTER popsicles!!! GENIUS!! !